The Huaneng Plaza is the company head quad ters of the Chinese Huaneng Group. The corporate group is the largest electricity producer in China and employs some 1,500 staff, with numbers rising. The provision of warm water for a building of these dimensions presented a special challenge for any kind of heating system. 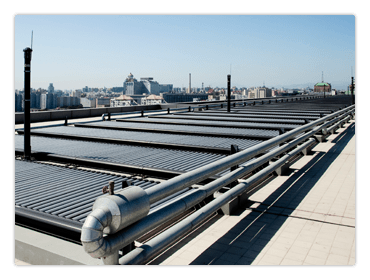 ELCO had the right solution ready on hand – a state-of-the-art and highly efficient solar plant for water heating. A total of 126 AURON 20 DF collectors are located on the roof of the building. The four water storage tanks, the water pump and the associated components are housed in the machine room on the 10th storey. Heat is constantly generated by means of electromagnetic induction, the daily capacity for water heating is 40,000 liter. The use of the sustainable product series from ELCO in the optimal utilization of the sun’s energy. Huaneng office building is not least proof of the company‘s commitment to energy-saving measures and environmental protection.